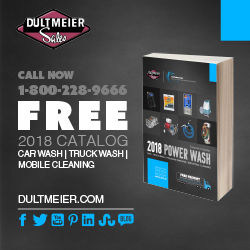 Things happen, and pressure washing equipment breaks down – especially for professional cleaning contractors who put hard hours on their equipment each and every week. 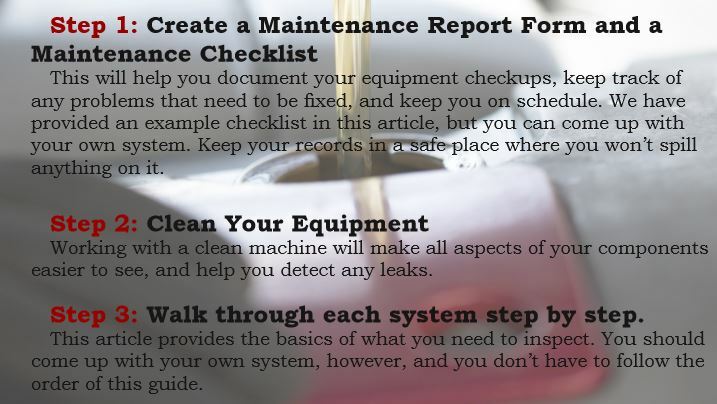 That said, there are things you can do to help keep your equipment running as long and as well as possible. That means keeping your equipment inspected and maintained on schedule. For this article, we are going to cover an in-depth equipment check that should be performed at least monthly, or after a particularly heavy period of use, or if the equipment was used in an unusually harsh environment. This is particularly important when you have technicians, besides yourself, who work with your equipment. The more technicians you have, the more likely you’ll run into problems. Keeping your equipment properly maintained and providing adequate pressure, flow and temperature means fewer hands tinkering with the adjustments in the field. (Not to mention less down time.) Equipment checks also help reduce accidents. • Make sure your water supply is clean and adequate. • Check all inlet or inline water filters for debris. • If you are using a float tank, allow the float tank to fill up and see if the float valve shuts off the water supply to the unit when the proper water level in the float tank is reached. 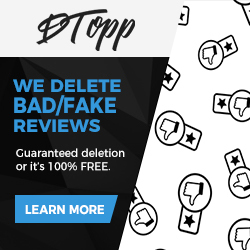 • Check the float tank for debris. • Check your records to see when your last oil change occurred. Change the oil if it’s time. Otherwise, proceed below. • Use either a dipstick or sight glass to visually inspect that your pump has an adequate amount of oil. If it’s low, add more or change the oil. • Inspect to see if the oil appears milky colored. (This discoloration indicates the oil has been contaminated by water.) If it is milky, change the oil. Then inspect the oil again after several hours of operation. If the oil is still discolored, it’s likely due to the oil seals leaking and they will need to be replaced. Otherwise, the milky oil was probably due to condensation. 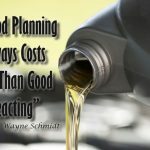 • If the oil is low, add more or change the oil. • Carefully inspect your hose and look for any cover damage as well as coupling damage. • If the cover is damaged to the point that reinforcing wire is exposed, remove the hose from service and replace it. • Store your hoses properly – preferably using a properly rated hose reel – to reduce damage and prevent accidents. • With your machine turned off (unplugged if electrical), open the cover and check the drive belt tension. • Check the belts for wear, and replace them if wear is noticeable. To do this, locate the slots that are either in the pump mounting rails or plate, or in the frame. Loosen the mounting bolts, then slide the pump until the pump is tightened. If you tighten the belt too much, bearing wear will result. Too loose and the belt will slip. • Check your engine’s fuel and oil levels. Refuel if needed using an approved fuel can. Always make sure the engine is turned off when refueling. • Add or change engine oil as needed. • Check your burner’s fuel supply, ensuring there’s enough fuel in the tank. Make sure you are using the correct type of fuel oil or kerosene or you may damage the pump, which relies on the fuel passing through it for lubrication. Check the burner’s fuel filter bowl (if visible) for debris. Add fuel if needed. • Check to make sure the fuel source, tank, and drum are not contaminated with water or debris. • If you find that anything is contaminated – or the wrong fuel was used – drain and change the fuel. To flush the pump, clean the tank, fill it with clean fuel, then connect a different return line, stick it in a separate container and let the system run. The clean fuel will flush the pump and the contaminated fuel will flow out the return line into the new container. Otherwise, the same trash will be flushed back into the fuel tank. Do not flush the pump through the bleed valve. • Make sure fuel cans are clean. • Remove the discharge quick connect and check for scale deposits – i.e., the inlet is turning white – around the discharge fitting. • If scaling is found, you will need to descale, add water pretreatment, or both. • You can determine the amount of scaling by testing for backpressure from the scale causing restrictions of the coil. If the pressure rises more than 10% above normal operating, descaling may be necessary. • If you use extension cords, carefully check to see that they have operable grounding prongs and the proper plug for the units’ power requirement. • Replace any cord that appears to be damaged. • Replace any cords that are ungrounded. • NEVER operate a pressure washer that appears to have potential electrical problems. • Ensure that any cords you use are appropriate to meet your equipment’s demands and avoid overheating. 8. Check your safety ground. • Use a multimeter set to measure continuity, or a test light, and check for continuity between the grounding leg on the equipment plug to exposed metal on the equipment frame. appropriate ground fault circuit interrupters (GFCI). • Do not operate equipment without a ground or with a “suspicious” ground. • If the circuit breaker trips, make sure the circuit breaker is rated for 20 amps or more (if using a 115V cleaner). • With your machine off, inspect all your nozzles for wear or damage, as well as for any obstructions. A clogged nozzle will create a distorted spray pattern. It will also cause potential problems in the system. However, if your nozzle is clogged, you may have problems in other parts of your system because the same debris that is clogging your nozzle likely clogged other parts of your system first. Sometimes, however, debris in the nozzle is picked up during storage. Debris may also result from worn seals, etc., in the system. To prevent nozzles from clogging from internal debris, start your system without the nozzle or with a variable pressure lance set to the lowest possible pressure. This may flush any debris out of the lance before it can clog the nozzle. Worn nozzles will eventually result in pressure loss as the orifice becomes larger. If you are using a fan nozzle, you will also notice a narrowing spray pattern. NOTE: If you are experiencing a loss in pressure, check your nozzle first for wear BEFORE adjusting your unloader. • When you clean your nozzles, remove them from your lance first. You can use a suitably sized probe, pushing from the outside in, to remove debris. • If lime or chemical scale is present in the nozzle, soak it in descaling solution or replace the nozzle. Scale inside the nozzle may indicate you have scale in other parts of your system as well. • With the nozzle still removed, flush your system to try to remove any additional debris that may be present. • Check the system’s fluid handling system for leaks by checking all accessible fittings and connections. Do this in a dry area so that leaks will be easier to identify. • If needed, open the machine’s cover to check for leaks throughout. • If water is running out from under the float tank, check to make sure the float tank is filled with water by holding the float down and allowing the tank to overfill. Then drain and seal the float so that condition will not reoccur. • If the float appears to be damaged, the float or float valve assembly may need to be repaired or replaced. • Look for debris in the float tank. If debris is present, clean the tank. • Make sure the float tank cover is in place and intact. • If you have a pressure gauge, check to see that the output pressure is within 5 to 10 percent of the rated system pressure. If you don’t have a pressure gauge, consider adding one – especially if the unit seems to be running higher or lower than normal. • Check the system and pump for chattering or vibration, which may indicate an air leak into the system or a water-starved pump. Check for air leaks and that there’s no air in the system. If you have an air leak, you will need to purge the system of air after the problem is corrected. • If you hear chattering or vibration and there is no air leak, you may have inlet water that is too hot or a stuck check valve. • If your pressure is too high or too low but the pump action is normal, you may need an unloader or pressure regulator adjustment. CHECK YOUR NOZZLE FIRST, however, to see if nozzle wear is the cause of the problem. • Before adjusting your unloader, open and close the trigger gun several times. If you have a pressure gauge, inspect whether or not there is not an excessive pressure spike when you release the trigger. • If you have a flow-actuated unloader and unloader cycling is noted, either your system flow is not optimum or you have the wrong orifice installed on your unloader. Debris in the chemical delivery system can cause a number of problems in your system, including flow unloader cycling problems in downstream delivery systems, and clogged pump check valves in upstream injection systems. • While your system is running and the chemical line is in the chemical container, open the chemical valve to see if the chemical flows correctly. You may need to modify the flow by turning the metering valve until an adequate amount of chemical is being delivered. • If you have a downstream injector, switch to low pressure to deliver the chemical. • Make sure the chemical line is fully submerged. If it is not fully submerged, you can introduce air into the system and can cause pump problems. • Check your chemical strainer for debris or clogging. If you don’t have a strainer in your chemical line, you should add one. If your valve shows signs of wear or damage, repair or replace it. • If you are using a downstream injector, make sure your injector has the correct orifice size. If the orifice is too small, you may experience a higher than normal operating pressure. This affects your ability to clean, and also puts a higher load on your power source. NOTE: If your system is chattering, or has low pressure or cavitation, it may be that the chemical valve simply needs to be closed. • Check your gun for leaking or damage. • If the gun is leaking out the back or the handles, you may need to replace the o-ring at the pin or piston assembly. • If the gun is leaking at the nozzle, you likely have a bad valve ball or seat. NOTE: This can cause the unloader to cycle in and out of bypass – i.e., causing the machine to start and stop even without an operator present. Remove the gun from service until it is repaired. • If the gun is leaking around the inlet or outlet fittings, this is a hard area to fix. These fittings are hard to remove and it’s best to leave them alone unless necessary. If you need to remove the fittings, clean the threads and tape with Teflon tape before reassembling the gun. than the aforementioned back, remove the gun from service until it’s fixed. • Check your safety lock and ensure it works. • Check the quick coupling that attaches to hose. • Make sure the trigger gun operates smoothly and the water flow is regular. • If the gun is leaking around the inlet or outlet fittings, the cause is likely because someone messed them up while trying to remove the discharge hose or lance improperly by holding onto the gun and trying to unscrew the discharge fitting, in turn loosening the internal gun connection. Instead, when removing a spray lance or discharge hose, it’s best to hold the trigger gun inlet or outlet securely, using two wrenches – one to hold and one to turn. This will keep the gun from leaking. • Inspect the lance to ensure it is not damaged or bent. If it is noticeably bent or damaged, remove it from service. • If using a variable pressure lance, check its operation by adjusting the pressure from low to high to low several times. • Check how well your burner is heating. With your equipment operating and the thermostat set to its highest temperature below steam mode, check to see if the equipment gets up to its rated temperature and how long it takes. • See if smoking stops within about a minute or less. If not, there is likely unburned fuel in the combustion chamber which will need to be drained or burned out. • If there is moderate smoking, you may have an improper air adjustment. • Open and shut your trigger gun several times to make sure the burner shuts off/ restarts quickly and properly. If it does not shut off when the gun is closed, you may have a boiler control problem. Remove the unit from service until the problem is corrected. • If the burner does not restart promptly after the trigger is relased, you probably have a fuel delivery problem. This problem can be hard to identify, however, because you may also have air delivery or ignition difficulties. • If the burner isn’t operating at its top conditions, check the fuel, air and ignitions systems and adjust until it reaches proper operation. Sooting is caused when carbon deposits in fuel do not completely burn, usually due to the insufficient delivery of air needed for proper combustion. 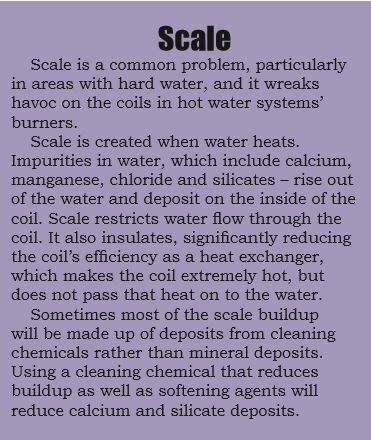 Like scale, soot can insulate the coil and cause the water to not heat properly. • With the burner turned off, look inside the burner stack to see if there are excessive carbon buildup. 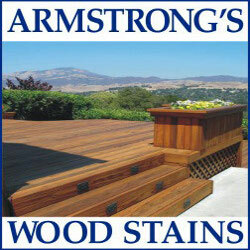 • For excessive soot building, desooting – which requires removing the coil and washing it off – is probably needed. • Sooting is usually caused by a lack of adequate air supply. In general, burners need .9 cubic foot of air for every 100 Btu produced. So, for example, a 195,000 Btu per hour burner needs 1755 feet of air. • A smoke testing kit can be used to correct problems. 17. Check your chemical inventory. As a final step, this is a smart time to make sure you have enough chemicals on hand and that they are stored safely with lids secured.